You can easily search for a MOV to WMV converter to convert your video files easily enough. You will need to use the browse button to select the mov file and to set the wmv as an output format in order to convert your file. You will need to convert MOV to WMV online by converting one file to another. MOV files contain different tracks in a hierarchy called atoms that can have media or data. The MPV and MP4 files use the same container which is referred to as an MPEG-4 file. 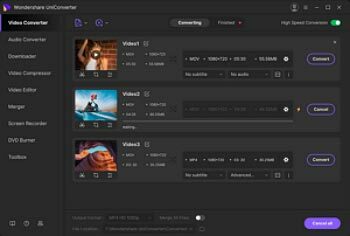 QuickTime is usually used so that this has the most support .mov files can be embedded to media in other types of file and early versions of QuickTime will allow viewing of MOV files although some of the later types of QuickTime have other options such as editing and exporting. The .wmv file is actually a compressed video file format that has different proprietary codecs that are developed by Microsoft. The files are format encoded by using the wmv codec. You can convert MOV to WMV online by creating high quality Microsoft wmv videos by using an online wmv converter. You can upload your video so that you have a URL created as a file to start the free conversion. You can also easily convert an AVI to WMV with the free converter. The wmv conversion can be done from a variety of different sources or formats. Step 1 Search for the suitable software to convert MOV to WMV online. You can simply search for the most suitable software by searching on Google and following some of the instructions that are available for the specific software that you have selected. The three most popular types of online converter are as follows. The MOV file format is most know for use with Apple and QuickTime which is compatible with Microsoft and MacOS platforms. MOV files can have two or more tracks saved of different types of video or audio for example. Music and video editing can be completed easily. The WMV files usually contain audio from Microsoft although they can be played on a variety of video players on Mac and PC machines. Some files may be protected by copyright. You can use the video converter easily by selecting the file that you want to convert from MOV to WMV format. You simply click to encode for free and then customize the settings by using the options under Advanced Options. The files is converted and then you can save it in that format on your computer. You can download a file online from one format to another by selecting the options you require. The media can be converted easily by using this simple method and then you can save the created file on to your computer. Step 2 From the mov and upload to the online video converter. Firstly, you need to confirm the file format to make sure that the movie that are converting to is in a .moy file. The movie/video format can be recognised by the Windows Movie Maker although this can be a limitation in terms of using the file. You need to make sure that you are dealing with a .MOV file and open up the Explorer and navigate to the directory of the movie. There should be an indication that it is a “Quicktime Movie” so that you can move on to the next stage. You can launch the Windows Live Movie Maker and download it for free. You can view the program by going to the start menu and launching it from All Programs under Windows Live. You can import your video into Windows Live Movie Maker by adding the videos and photos under the Home tab. The video can be tested at this stage to make sure that it works properly. Step 4 Download the converted .wmv file. You can Export the movie in to a .WMV format under settings. Then you can save the file with a name under your document area. The conversion process should progress and the speed will vary according to the speed of your computer. You can process the mov file and upload it to the online video converter by drag and drop. Apparently, Wondershare UniConverter (originally Wondershare Video Converter Ultimate) allows you to download effectively. The conversion speed is much faster than other types of conversion tools. Overall, the quality of the video is of a much higher quality. Wondershare UniConverter (originally Wondershare Video Converter Ultimate) can be tried for no fee and then you can sign up later which is chargeable with different packages on offer.